Heat oil in a pan, temper with mustard,channa dal,fenugrek & Curry leaves. Add sliced onion, garlic saute for few mins. Add chilli powder, turmeric powder , salt and mix well. Add tomatoes & allow to cook until mix well. Allow to boil, until almost reduced & add 3 cups of water & allow to boil. Finally add fresh coconut paste & Mix well. Allow to cook for few mins. Serve hot with Rice, Dosa, idly or Rotis. good one..have to try adding coconut paste..sounds delicuious..
Good, i can bookmark this recipe for future reference.. i always wanted to try this. Mouthwatering pictures. Makes me hungry. Nice recipe... YUM! 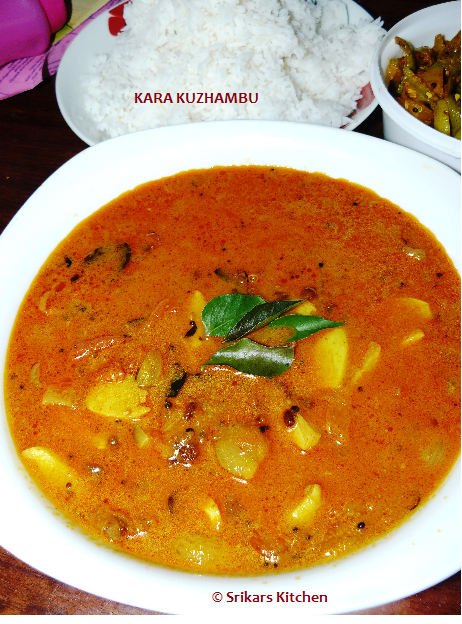 Sri..Kara kuzhambu makes me hungry..with hot steaming rice topped with ghee , just mouthwatering..
Oooh - looks delish! Where do I get coconut paste??? I have powdered coconut - can I make that into paste? Perfect with rice and papad. Dear jan u can use coconut powder instead of coconut paste. 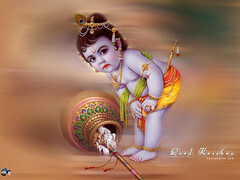 hey idhula puli ilaya? sambar podi? pls reply in my blog..if u don't use puli, will kuzhambu taste good?